Beautiful newer 2 bedroom / 2 bath elevated tropical home near a waterfront common area in Venture Out, an Oceanside Resort (Unit #618). Relax on a large elevated covered deck for outdoor dining and entertaining and a downstairs covered area with hammock, table, lounge chairs and covered parking. A stainless steel gas grill enhances the outdoor dining. The home can sleep up to 6 adults in comfort. The open Living area includes a cathedral ceiling, a full kitchen with new stainless steel appliances with all dishes, silverware and cooking equipment, a dining room with a table for 6 and a living room. The living room has a queen size sleeper sofa, chairs and love seat, a 50' Flat Screen TV w/ enhanced cable and combo VCR/DVD game inputs, AM/FM CD player. Also included is a wheeled beverage cart that can be used indoors or on the deck. The Master Bedroom has a queen bed with a 26' flat screen TV w/DVD, a double walk in mirrored closet and a full-size master bathroom with shower, vanity sink, toilet, and towels. The Guest room has a queen bed, a 32” flat screen HDTV, a walk in closet and a 2nd full-sized bathroom with shower, vanity sink, toilet, and towels just a few steps down the hall. Off of this bathroom is a stacked washer and dryer combo for your use. Additional unit amenities include: Free Use of 1 Tandem and 2 single Kayaks, Central Air Conditioning, Free WIFI, Washer/Dryer, Dishwasher, Central air, Ceiling fans, Microwave, Coffee maker, AM/FM CD player, Icemaker, Ironing board, iron, hair dryers and beach towels for the pool or beach. The resort amenities include: 24 hour security, Lighted tennis courts, Olympic-sized heated pool, kiddie pool, spa Jacuzzi, ping pong, bocce ball courts, pickle ball, lighted basketball court, children's playground, pool table, darts, Marina complete with 2 ramps, gas, store, ATM and fish cleaning station, boat trailer parking onsite, open water picnic areas, ocean front tiki hut, lending library, post office - and MORE - ALL IN A GATED COMMUNITY with a mixture of RV sites and manufactured homes where you can feel safe and secure. Six bikes (4 adult - 2 child) are provided for your riding pleasure at no extra charge. We also have sports equipment, fishing poles with basic tackle, a cooler and 4 beach chairs for trips to the beach, pool or off site. Bring your boat! There is no charge for launching in at the Venture Out Marina (There is a small charge for overnight parking). The Florida Keys have some of the best fishing in the world! (Boat and trailer parking is an additional daily charge by the park.) It is also a great spot for Kayaks. You can swim or fish from our open water areas. There is a big TIKI HUT on the open water where picnicking is perfect! KEY WEST is a twenty five minute drive down US Route 1. Experience the fabulous SUNSET CELEBRATION every night at Mallory Square. Take a day trip to the Dry Tortugas. DANCE the night away at Hog's Breath Saloon, Sloppy Joe's or one of the many bars of Key West. VISIT the Southernmost point, Hemmingway’s house, Key West Light and Fort Zachary Taylor. Take a sightseeing tour on the Key West Trolley or Conch Train. ENJOY a beautiful sunset cruise, snorkeling, SCUB diving, fishing, parasailing and so much more. Or you can simply enjoy a good book or the company of your family or spouse on the grounds of the resort. Within several minutes we have some great restaurants. They include The Square Grouper, Boondocks and Loo Key Restaurant to name a few. Most offer good food, open air dining, reasonable prices and a relaxed atmosphere. SORRY, THIS IS A NO SMOKING / NO PET HOUSE. Smoking is allowed in the lower area (ground level) of the home. This is a very clean rental unit with numerous amenities offered at a very reasonable rate. You will not be disappointed! We know you will have a marvelous time here in the gorgeous FLORIDA KEYS! Please note that there is a $53.75 entry fee for our gated community that you will have to pay at the front gate. This gives you FULL access all of the resort’s amenities. Driving Distance: 3 Hours from Miami, and 3 1/2 Hours from FT. Lauderdale. 25 Minutes from Key West and Big Pine Key, home of the famous Key Deer. We are a retired couple with a vacation home in a great location. We enjoy traveling and sight seeing. We especially love the Florida Keys and try to spend several weeks there each year. We fell in love with the Florida Keys on our first visit. The tropical weather, attractions and relaxed atmosphere were exactly what we were looking for. To us, this is a tropical paradise with out leaving the US! It is a bonus that we don't have to fly to get here. The resort amenities, The relaxed atmosphere, the tropical weather, the scenery, the open air dining, the fishing and the fun of Key West and .many islands. The resort, Venture Out is directly on the ocean. 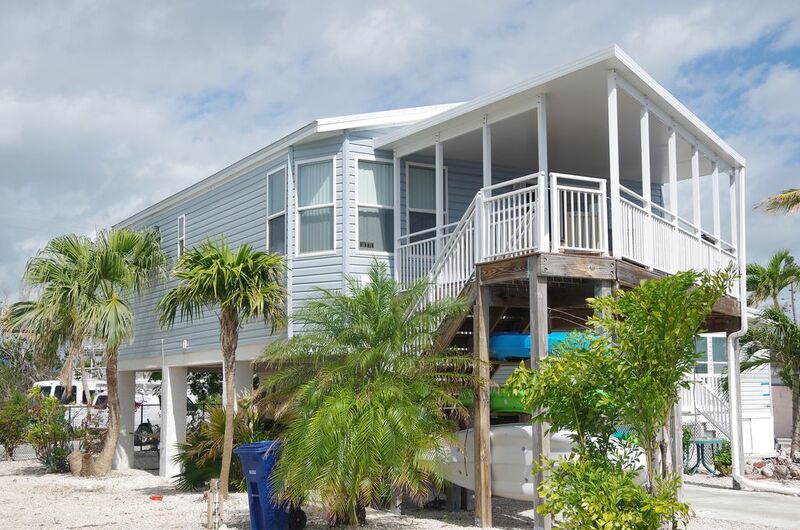 There is a marina, ocean side pool, salt water swimming area, tiki hut and lounging area with ocean view. Home is in a gated community with many amenities and 24 hour security. ONLY outside the unit with proper disposal. We really enjoyed this home rental. It was absolutely clean and very relaxing. We also liked the fact that it was in between of every place that we visited. We also rode the bikes around the resort and everyone was very friendly. We will definitely be returning!! !